IN A LINE Great outfit for the price, shame about the small jacket pockets. 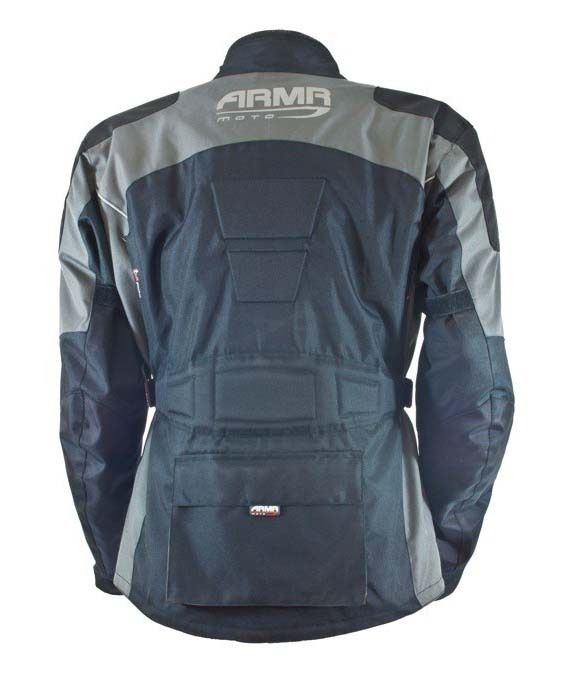 DESCRIPTION Adventure style jacket with breathable waterproof liner, usual armour and six pockets. 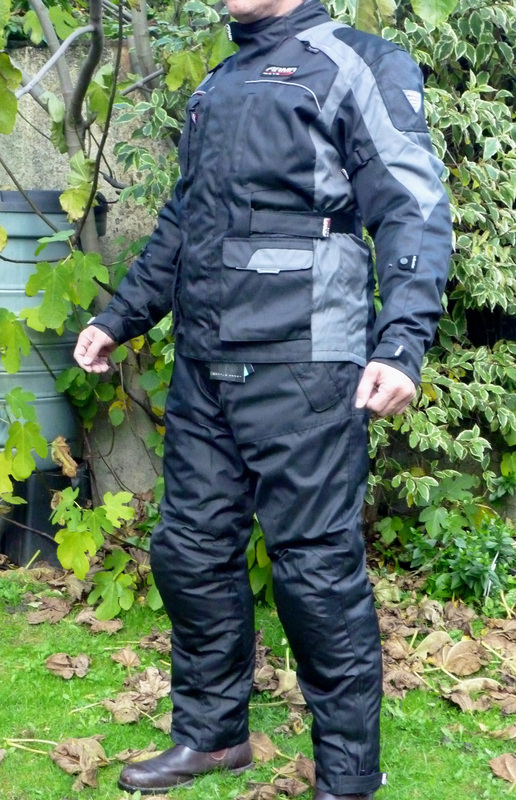 Plus trousers with removable waterproof liner. Also, armoured waterproof gloves. See also my Hirama jacket review and this. WHERE TESTED UK and Morocco. Annoyingly sticky velcro on the jacket! REVIEW I’ve been wearing the Armr Moto Kiso jacket for about a year now, having given up on the previous Aerostich Falstaff. I paid £100 for the jacket and trousers and the outfit is still widely available at that price. For that money: jacket, trousers and a free balaclava too, if was worth a punt even if it all turned out to be crap. How bad can a breathable outfit be for under a hundred quid? The quick answer: not bad at all. This is not some poorly designed rubbish you might buy from Aldi during one of their moto bargain offers. And it just shows how overpriced high-end gear is (not that that was any kind of surprise). The same outfit from Klim would cost well over ten times as much. 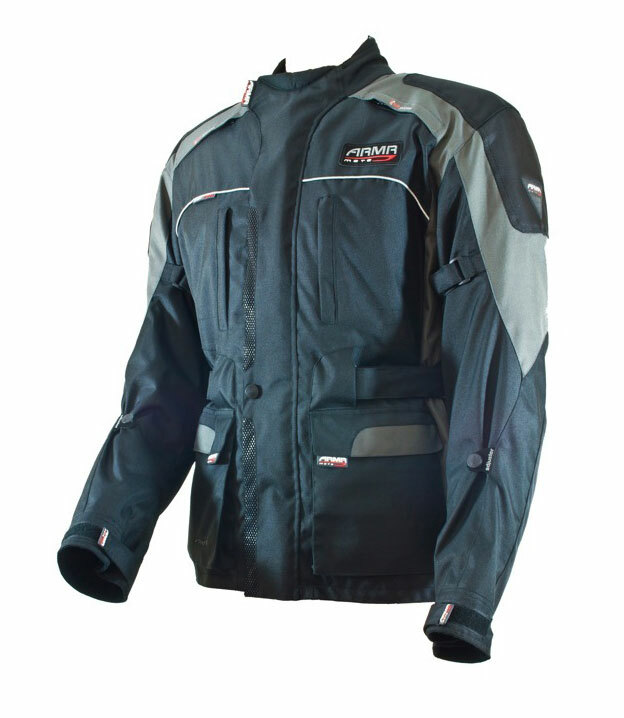 The jacket is well designed with a good combination of colours, useful features and a flattering cut. It fits me better than my previous Aero Dariens – or perhaps is a bit too snug. The arms are long enough and so is the hem. You get velcro and a stud on the arms to take up the slack and annoyingly sticky velcro on all the pockets and across the front storm flap which has embedded edges against wear, plus neoprene edging round the collar. The Kiso came with an extra zip-in thermal layer, but this looked like a cheap bit of quilted nylon crap. I ditched that quick to make room for my Aero Kanetsu electric vest. 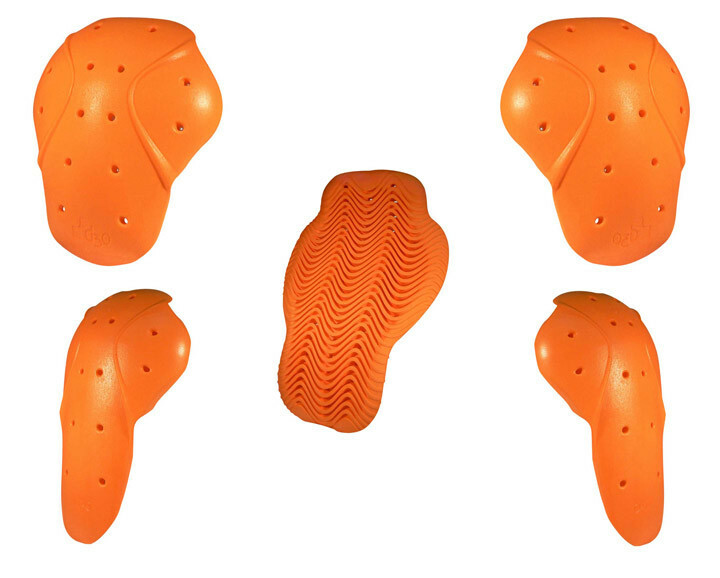 The jacket has unobtrusive armour made of dense, dual density closed cell foam (left) at the elbows and shoulders, plus bits of foam embedded in the back panel. I noted one amazon reviewer panned the coat on account of these but what did they expect for £100? I’ve never normally liked the bulky crash pads that came with my older Dariens, but if I was serious about protection I’d buy a five-piece body heat-forming D3O armour kit (right) for the Kiso. Aerostich use this now. The four small frontal vents are rather tokenistic and would provide little airflow in a desert, but I feel that way about most vents on breathable jackets. The quickest way to cool down is to unzip the front and have a big zip across the back, like Aerostich jackets. All is well until you come to the pockets: four on the front (with hand warmer slots on the lower ones), one inside and one on the back. All well made with waterproof plastic liners. The problem is they are too darn small. 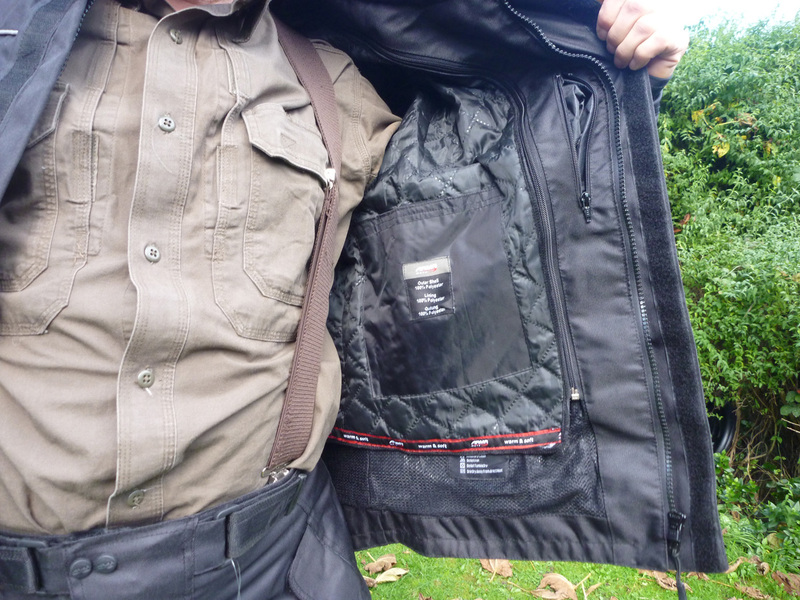 Perhaps I have become spoiled by the superb array of capacious pocketure found on Aero Dariens. You can barely get your hands into the Kiso’s upper pockets which I find most useful on a coat. For a jacket in the adventure travel style where pockets are useful, it is the Kiso’s biggest let down. As for waterproofing, the Kiso follows the cheap trend of a separate breathable liner, though this is sewn in under a mesh liner so can’t be removed to aid breathability. The couple of downpours and longer spells didn’t see it leak outright like the Falstaff, but my shirt was damp on arrival. I am prepared to put that down to condensation, not rain and which was possibly exacerbated by the heat from my electric vest? Either way it means the liner is more waterproof than breathable. 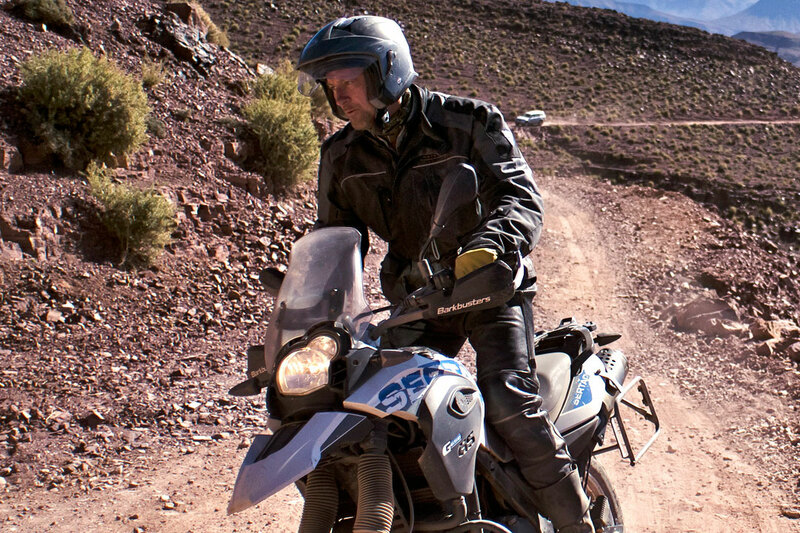 You can read what I think the whole idea of breathable fabrics for motorcycle touring below and if you accept you can’t really have both, in this country I suppose I’d rather have something too waterproof than too breathable. The trousers I’m not so keen on. The supplied size was too small, I think I got a XXL in the end for my 38″ waist but still quite a close fit. There are two zip up side pockets, legs are long enough, braces are handy but the zip-in waterproof liner made the whole arrangement just too bulky and faffy. 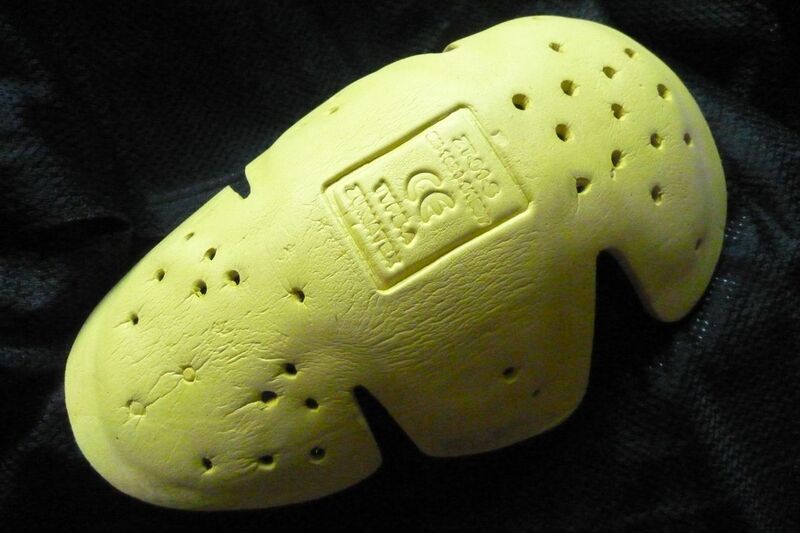 I also found the knee pads uncomfortable over a few hours when worn with my usual leathers which also have padding. Perhaps wearing normal trousers would have been fine. Removing the pads along with the liner made an extra layer over my leather trousers, but in a downpour quickly they quickly leaked. At least they dried off quickly too. I have to admit I don’t really like wearing this sort of clobber and preferred my Darien pants with the full length side zips for easy removal (though I never tested them in the rain). Otherwise, the leathers will do me most of the time and if it pours I’ll pull on my bombproof old Rukka PVC one-piece over my legs. Normally I wear thin elkskin ‘workman’s gloves’ which I pick up in the US cheap. 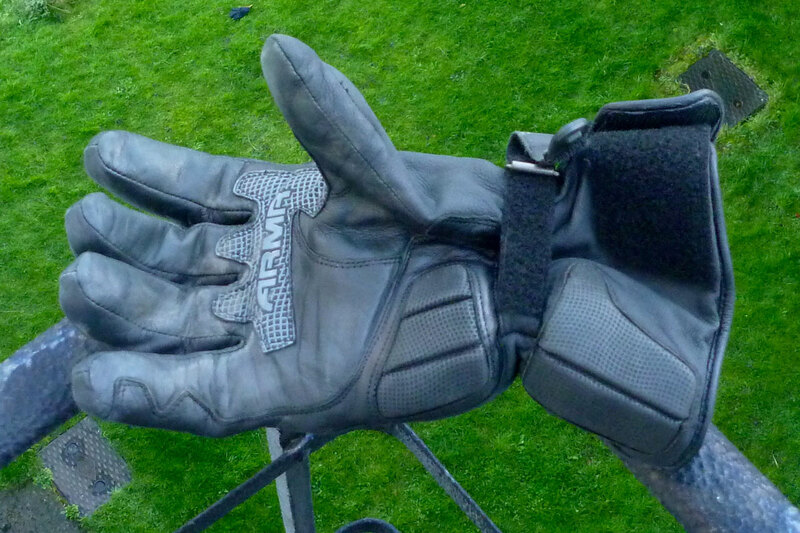 These thicker Armr WXP8s (since superseded or renamed as WPL245) are nicely curved but the large size has fingers a bit too short for me, the velcro strap seems redundant against the larger velcro flap but I guess is there to keep the glove on in a heavy crash. I expected the gloves to succumb to the rain eventually and they have, though I admit for just £40 such a complex shape must be a nightmare to seal with membrane. And when they’re wet you tend to snag out the lining as you pull them off which may, as on other gloves I’ve had, not get pushed fully back in and create discomfort. Overall, I think I may try and track down something that fits me better, but expect them to eventually leak too. 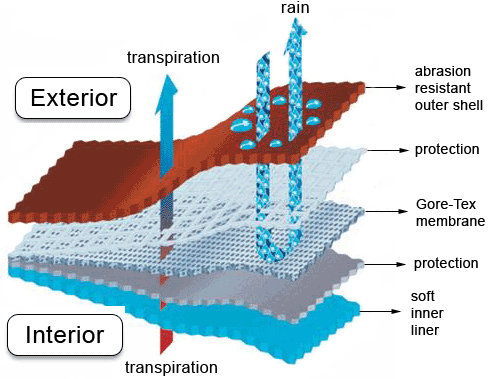 As I write in the book, breathable fabrics claim to work by using body heat to purge water vapour molecules through the membrane which happens to be too small to allow the ingress of date droplets. That may work huffing and puffing up Helvelyn in the rain, but surely not when sat still on a bike at 65mph. Top end breathables might work well when it’s new, clean and undamaged, but as far as I know we’re talking about a cling-film-like miracle pore layer either bonded onto the inside of the jacket onto which is bonded a permeable inner liner (right), or a loose liner. Once it gets clogged with body oils or grime it will let in water for good and/or it won’t breathe like it did. You have to marvel at how WL Gore have managed to dominate the market in ‘waterproof’ leisure wear, although work wear, I’m no so sure. There must be something to it, but I do remember thinking when it came out in the late 70s that the whole ‘condensation vapour out / no water in’ malarkey sounded a little far-fetched and I think the same now. I would never buy an expensive GTX jacket that I like to think I’ll be wearing on a long trans-continental trip, not a touring holiday and that would require washing in special soaps and curing with DWR (surface water repellent) only to know the ‘magic film’ would eventually fail. Instead I’d rely on something like my old Rukka. 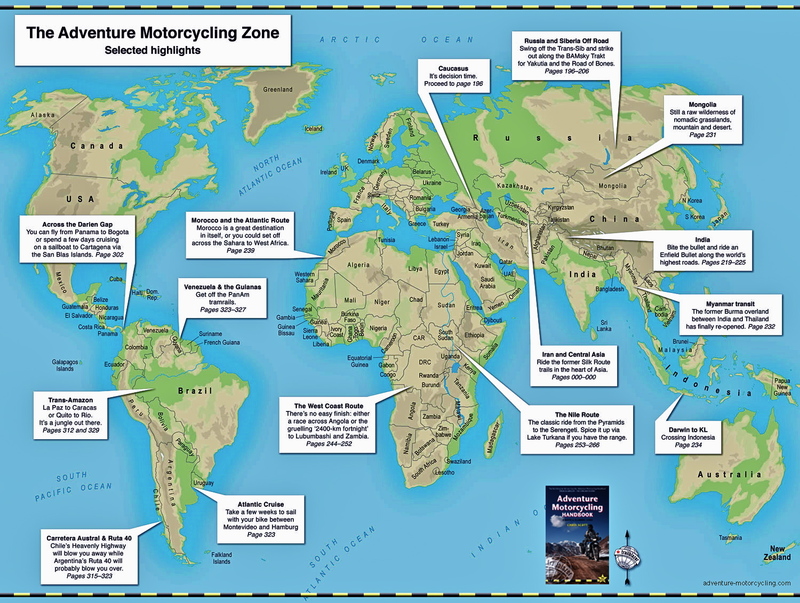 This entry was posted in Adventure Motorcycling Gear Reviews, AMH News, Jackets & Trousers and tagged Armr Moto Hirama jacket review, Armr Moto jacket review, Armr Moto Katsura pants review, Armr Moto Kiso jacket review, Armr Moto riding suit review, Armr WXP8 gloves review. Bookmark the permalink.